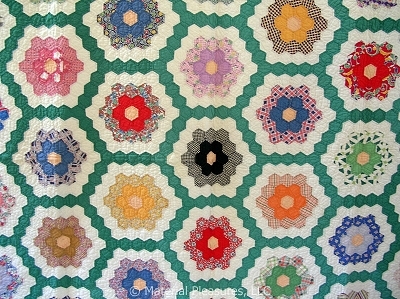 Vintage quilt from the 1940s, Grandmother's Flower Garden with a green garden path. It measures 81" x 87". There are 55 complete flowers and 8 partial flowers. Each flowers is made up of a yellow center, surrounded by a solid, surrounded by a coordinated print, and then a white solid. A very typical setting and layout. I like how she finished the top and bottom edges, a very well planned quilt. And I like the center black flower. Each hexagon measures 1" across a side. It is hand pieced and hand quilted in white thread to each hexagon. The backing is a white solid fabric, and the batting is thin. There is an applied white binding (by hand and machine). It is in good condition. There are a few spots, and one pink fabric is deteriorating (6 hexagons). I can provide a c1930s pink solid to the buyer, to replace the fabric at no additional cost.